In html we are not required to indent elements (to leave spaces before the opening tag), but if we don’t indent them, the structure of the page becomes difficult to follow. Now let’s see the elements of our template; don’t worry about understanding each of them; we will go over the ones that are important later. 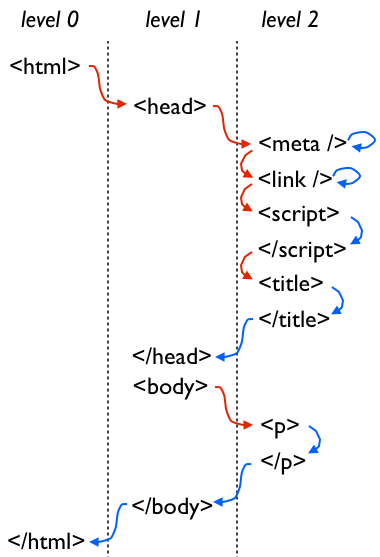 We nested each element inside another, without overlaps, e.g., the ‘head’ and ‘body’ are nested inside the ‘html’ element; once we open the ‘head’, we cannot open the ‘body’ until after we close the ‘head’. 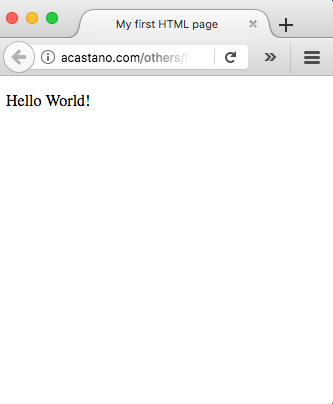 Likewise, the ‘meta’, ‘link’, ‘script’ and ‘title’ elements are all nested in the ‘head’, and a paragraph ‘p’ is nested in the ‘body’; this paragraph has the content of our page, i.e., the string ‘Hello World!’. Some elements, like ‘meta’ and ‘link’ are ‘self-closing’, i.e., their tags open and close immediately. They have the form <tag-name/>. The closing tag of a few elements is optional, e.g., a paragraph element closes with either a </p> tag, or with a carriage return, so the </p> tag is optional. The webpage loads fine in spite that lines 5 and 6 point to style and script files that don’t exist. HTML looks for these files but since it cannot find them (because we have not created them yet), it simply ignores them.